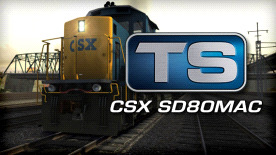 Packing 5,000 horsepower and a 20-cylinder engine, the SD80MAC was a regular coal hauler across Pennsylvania, and is now here in CSX livery for Train Simulator. Thirty units were built by EMD for Conrail between 1995 and 1996 and were the first diesel locomotives to use a 20-cylinder engine since EMD’s SD45 and SD45-2 models. Their huge motive power and 75mph (121 km/h) top speed also made them slightly more powerful than GE’s EVO series, making them ideal candidates for the heavy coal trains of Pennsylvania.